You will operate an ABRAKADOODLE® business which provides arts education programs for 20-month-old to-12-year-old children. The initial franchise fee is $32,500 for a standard territory with 60,000 qualifying households. The fee for additional territory, if available, is $0.35 per qualifying household, but a territory will generally not exceed 120,000 qualifying households. At our option, we may reduce the initial franchise fee by $3,000 if you already operate a similar business or have been employed for at least 1 year by an ABRAKADOODLE business. The estimated initial investment ranges from $40,695 to $72,470. 1. YOU MUST ARBITRATE WITH US OR SUE US IN VIRGINIA. OUT-OF-STATE ARBITRATION OR LITIGATION MAY FORCE YOU TO ACCEPT A LESS FAVORABLE SETTLEMENT. IT MAY ALSO COST YOU MORE TO ARBITRATE OR LITIGATE WITH US IN VIRGINIA THAN IN YOUR HOME STATE. CERTAIN STATE AND LOCAL LAWS MAY SUPERSEDE THIS REQUIREMENT. PLEASE REFER TO ANY STATE-SPECIFIC ADDENDUM THAT MAY BE IN THE OFFERING CIRCULAR FOR FURTHER DETAILS. 2. VIRGINIA LAW GOVERNS THE AGREEMENT, AND THIS LAW MAY NOT PROVIDE THE SAME PROTECTIONS AND BENEFITS AS LOCAL LAW. YOU MAY WANT TO COMPARE THESE LAWS. PLEASE REFER TO ANY STATE-SPECIFIC ADDENDUM THAT MAY BE IN THE OFFERING CIRCULAR FOR FURTHER DETAILS. Registration of this franchise with the state does not mean that the state recommends it or has verified the information in this offering circular. If you learn that anything in this offering circular is untrue, contact the Federal Trade Commission and the appropriate agency listed in Exhibit A. THE CALIFORNIA FRANCHISE INVESTMENT LAW REQUIRES THAT A COPY OF ALL PROPOSED AGREEMENTS RELATING TO THE SALE OF THE FRANCHISE BE DELIVERED TOGETHER WITH THE OFFERING CIRCULAR. ALTHOUGH THESE FRANCHISES HAVE BEEN REGISTERED UNDER THE RHODE ISLAND FRANCHISE LAW. REGISTRATION DOES NOT CONSTITUTE APPROVAL-RECOMMENDATION OR ENDORSEMENT BY THE DIVISION OF SECURITIES THAT THE INFORMATION PROVIDED HEREIN IS TRUE. COMPLETE. ACCURATE OR NOT MISLEADING. fa) A prohibition on the right of a franchisee to join an association of franchisees. (b) A requirement that a franchisee assents to a releaser assignment, novation, waiver, or estoppel which deprives a franchisee of rights and protections provided in the Michigan Etanchise Investment Law. This shall not preclude a franchisee, after entering into a franchise agreement, from settling anv and all claims. davs. to cure such failure. fd) A provision that permits a franchisor to refuse to renew a franchise without fairly compensating the franchisee bv repurchase or other means for the fair market value at the time of expiration of the franchisee's inventory. suppliesr eguipmentr fixturesr and furnishings. Personalized materials which have no value to the franchisor and inventoryr Supplies, equipment, fixtures, and furnishings not reasonably required in the conduct of the franchise business are not subject to compensation. This subsection applies only if: l\\ The tejm of the franchise is less than 5 years and (H) the franchisee is prohibited bv the franchise or other agreement from continuing to conduct substantially the same business under another trademark service mark, trade name, logotype. advertisinqr or other commercial symbol in the same area subseouent to the expiration of the franchise or the franchisee does not receive at least 6 months advance notice of franchisor's intent not to renew the franchise. transfer its obligations to fulfill contractual obligations to the franchisee unless provision has been made for providing the required contractual services. The franchisor is Abrakadoodle, Inc. For ease of reference in this disclosure document, Abrakadoodle, Inc. is referred to as "we" or "us," and the person who is considering the franchise is referred to as "you." If you are a corporation, limited liability company, partnership or other legal entity ("legal entity"), certain provisions of the franchise agreement and related agreements will apply to your shareholders, members, partners, officers, managers and directors ("principals"). We are a Virginia corporation formed on October 17, 2003. We do business as ABRAKADOODLE. Our principal business address is 1800 Robert Fulton Drive, Suite 250, Reston, Virginia 20191. We have no predecessors or affiliates. Our agents for service of process are disclosed in Exhibit A. We offer a franchise model for businesses that provide arts education programs for 20-month-old to 12-vear-old children ages 2 to 12 under the trademark and trade name ABRAKADOODLE©. If you purchase a franchise, you will be the owner of the franchised business, with staff to assist in the teaching and operations of the business. Additional staff may be employed as your business grows. You will present ABRAKADOODLE® programs at facilities - schools, day care centers, community centers and other host sites - operated by others. You must introduce your programs to the operators of those facilities before presenting programs to children at the facilities. You are not required to operate your own educational facility, although in some instances, you may choose to do so. We have contacted, and intend to continue to contact, national and regional operators of appropriate types of facilities to encourage them to permit programs to be presented at their facilities. You may also institute programs at host sites to instruct adults about arts education, and you may provide designated curriculum materials to those adults. You must operate the franchised business according to our standards and specifications, and sign our standard franchise agreement (the "franchise agreement") and related agreements (Exhibit B). You will compete with other local, regional and national companies offering other arts education programs for children. The market for arts education programs for children is developed in some major metropolitan areas but is undeveloped in other areas. Before signing a franchise agreement, you will be expected to survey your market to determine the number of competitors, the number of facilities and children they are likely servicing, and the perceived quality of their programs and materials. We are not aware of any laws or regulations specific to the operation of arts education programs for children, although you must comply with all local, state and federal laws and regulations applicable to the operation of any business. We urge you to inquire about these laws and regulations. We have not engaged in any other line of business, have not offered franchises in any other line of business, and began offering franchises in February 2004. Our founder, Mary C. Rogers, has operated a business of the type being franchised since 2002. Chairman of the Board, President/CEO and Director: Mary C. Rogers. B.S.. M.Ed. Mary Rogers has been our Chairman of the Board, President/CEO and Director since November 2003. From August 2002 to November 2003, she was the founder of the ABRAKADOODLE program in McLean, Virginia, and from May 1998 to the present, Mary has been President and CEO of Rogers and Associates in McLean, Virginia. Mary has over 20 years of experience in education and franchising. In 1988, she co-founded ECW Corporation, the franchisor for Computertots, an international computer education franchise. She served as its Chief Operating Officer from 1988 until 1997, when she sold her ownership interest. Mary is a national speaker on topics such as enrichment education and franchising. She has been on the Board of Trustees of the International Franchise Association's Educational Foundation from 1999 to 2004. She has been the President and Executive Director of the Capital Area Franchise Association. Vice President of Development: Rosemarie H. Hartnett, B.A. Rosemarie Hartnett has been our Vice President of Development since October 2003. From May 2003 to September 2003, she performed a similar function for the ABRAKADOODLE program operated by Mary Rogers in McLean, Virginia. From April 2002 to February 2003, she was Marketing Manager of Bread & Chocolate in Alexandria, Virginia. From June 2000 to December 2001, she was Vice President of International Development of Tutor Time Learning Systems in Boca Raton, Florida. From August 1999 to May 2000, Rosemarie was Executive Director of The Franchise Talk Network in Washington, DC, and from August 1991 to April 1999, she was Director of International Programs of ECW Corporation in Great Falls, Virginia. Her duties with us include managing training, sales and program development. She has been the President of the Capital Area Franchise Association. We receive franchise leads from representatives of FranChoice, Inc.. If you are referred to us by a FranChoice, Inc. representative, and if that representative acts as a broker under applicable law, we will provide you with information on the representative that is similar to the information in Items 2, 3 and 4 of this offering circular. Periodically, we may also receive franchise leads representatives from other organizations. If you are referred to us by a representative from another organization, and if that representative acts as a broker under applicable law, we will provide you with information on the representative that is similar to the information in Items 2, 3 and 4 of this offering circular. No litigation must be disclosed in this Item. No person previously identified in Items 1 or 2 of this disclosure document has been involved as a debtor in proceedings under the U.S. Bankruptcy Code that must be disclosed in this Item. You must pay us, on signing the franchise agreement, a $2&t90032.500 initial franchise fee for a standard territory. Except as described below, this fee is uniform, is fully earned when the franchise agreement is signed, and is non-refundable, except that we may, at anytime before you successfully complete initial training, cancel the franchise agreement and refund the fee, less expenses incurred, if we decide that you should not operate a business. We estimate our expenses will be in the $4,500 to $6,000 range. We may charge an additional initial franchise fee for a territory that is larger than a standard territory (as described insee Item 12). The additional initial franchise fee is calculated at a rate of $0.35 per qualifying household above our guidelines for a standard territory. This additional fee is uniform if required, is fully earned when the franchise agreement is signed, and is non-refundable, except that we may, at any time before you successfully complete initial training, cancel the franchise agreement and refund the fee, if we decide that you should not operate a business. We estimate our expenses will be in the $4,500 to $6.000 range. We mav choose to proportionally reduce the initial fee for a market that has substantially fewer than 60r000 qualified households within a 30-mile radius. IfWe mav choose to reduce the initial fee bv $3.000 if you already operate a business that is similar to an ABRAKADOODLE business4 or if you have been employed for a poriod of at least 1 year by an ABRAKADOODLE business, we may reduce your initial franchise fee by $3,000. In 2004. we sold 1 smaller-than-standard territory for an initial franchise fee of $18.900r and we sold 1 territory to a person who had operated a business similar to an ABRAKADOODLE business for an initial franchise fee of $25.900. We will provide, at no extra charge to you, initial training and training materials for up to 2 trainees. If you choose to send additional people to initial training, we will chargo vou must pay us a $3,500 training fee for each additional person. Training fees are uniform and non-refundable. You must pay for all yourtrainees'travel, meals and lodging. See Item 11 for additional information on training. Payable monthly by 10th day of each month. Note 1: All fees are imposed by and payable to us. All fees are non-refundable. In addition to fees, you may be required to purchase certain items from us (see Item 8). See Item 9 for references to sections of the franchise agreement on fees. received for services provided or products sold, whether for cash or barter or on a charge, credit or time basis, excluding excise, sales and use taxes, gross receipts taxes or similar taxes you pay based on sale, if those taxes are separately stated when the client is charged, and also excluding bona fide refunds, allowances or discounts to clients. Note 3: For all training, you must pay for your travel, lodging and meal expenses and for your trainees' and attendees' salaries and benefits and their travel, lodging and meal expenses. If you request our trainers or if they must travel to give you training, you must pay us the then-current per diem charges for those trainers and must reimburse us for their actual and reasonable travel, lodging and meal expenses. Note 4: Currently, we collect from you the fee that the network hosting company charges us. The fee may change if the supplier changes its fees. Currently, we also collect from vou the monthly fee that the supplier of the class management program charges us. although we pav the initial cost for training and implementation of the class management program. See Item 11 for information about our plans to change to a web-based equivalent of the program. The fee could change if the supplier changes its fees. Note 5: These fees are subject to change, but not so as to unreasonably increase your obligations. For example, we may develop new training courses that may require fees different from those currently charged. Note 5: We will choose a class management software program to assist our franchisees in managing their record keeping for students, 6itos, toachors and schedules. It is included in the initial packet of materials that you receivo at training. Note 1: Neither we nor any affiliate offers direct or indirect financing to you for any expenditure. Except for deposits, all fees are generally non-refundable. products; the prevailing wage rate; competition; and the sales level that you reach during the initial phase of your franchised business. The estimate does not include any allowance for an owner's draw. The estimated initial investment and other estimates in this offering circular do not take into account your personal living expenses, any debt service needs, ongoing working capital requirements, accounts receivable financing or other costs. 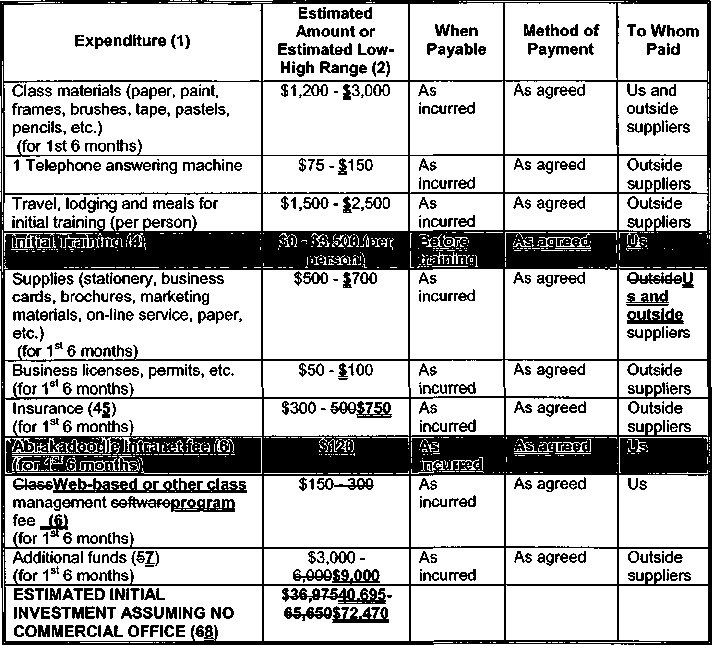 Note 4: The fee for training vou and up to 1 other person is included in the initial franchise fee (see Note 3). You may choose to send more than 2 trainees to initial training, if you pay us a training fee of $3,500 per additional trainee. Note 45: You must get and maintain insurance according to our specifications. Currently, you must maintain comprehensive general liability insurance with a limit of at least $1 million. An estimated annual premium for that insurance is $350 to $5QQt750. In addition, you must maintain automobile liability insurance with a $500,000 combined single limit or a $250,000/$500,000 split limit, and worker's compensation or similar insurance as required by law on all employees. Most franchisees already carry automobile liability insurance equaling or exceeding the type required, or are able tocan upgrade their insurance to the type required for an estimated annual cost of $100 to $400. An estimated annual premium for worker's compensation insurance is $200 to $400, based on estimated premium rates of $.50 to $1.00 per $100 of salary paid. Note 56: These amounts reflect the currently monthly fees for these services. See Items 6 and 11 for more information about the ABRAKADOODLE Intranet and required software and/or web-based programs. Note 7: You may need these additional funds to operate the franchised business during its 6-month initial phase to cover operating expenses that are in excess of typical start-up revenues. These expenses may include marketing, promotional, travel, office supply, printing and telephone expenses, minimum monthly continuing license fees, advertising and promotional contributions and annual conference. We estimate that you can expect to put additional cash into the business during the initial phase, but we cannot estimate or promise when, or whether, you will achieve positive cash flow or profits. We have not provided for capital or other reserve funds necessary for you to reach "breakeven", "positive cash flow" or any other financial position. estimates. You should review these figures carefully with a business advisor before making any decision to purchase the franchise. You are not required to lease or purchase a commercial office for the conduct of your business. Under Sections 5.3 and 15 of the franchise aareementHowever. if you choose to maintain a commercial office, we must approve your proposed lease or purchase agreement and the appearance of the proposed officeT (see Sections 5.3 and 15 of the franchise agreement). Many variables, including region, neighborhood, condition and size, will affect the cost of a commercial office and we cannot estimate these costs. You must purchase from us upgrades and support for the class managomont coftwaro we choose. The fee for these upgrades and support is $25 to $50 a month and is subject to change on an annual basis.eertain supplies containing ourtrademarks. such as our Framedoodle® picture frames. You may purchase from us various marketing materials containing ourtrademarks (brochures, posters, bulletin boards, etc. )., such as pocket folders. You also must purchase from us cortain supplies containing ourtrademarks, such as our Framedoodle picture frames. You must purchase certain Crayola® products for classroom use. We have negotiated a vendor agreement with Binney & Smith, the manufacturers of Crayola products, that allows vou to purchase Crayola products directly from the manufacturer's distribution center at a substantial discount. We will receive no revenues from your purchases of Crayola products. You must purchase or lease certain equipment, materials, supplies and services meeting our specifications. Also, you must purchase or lease initial equipment, materials, supplies and services in amounts that we recommend, to use our experience in the business and to provide proper initial planning, training and record keeping. :FheseThe initial equipment, materials and supplies include items such as a laptop computer, a digital camera, a-color printer for your offico, at telephone answering machine, stationery and business cards. See Item 11 for more information about the computer and other items, some of which are acquired from an approved vendor. effect. We may perform tests to determine if any equipment or supply meets our specifications. We will charge you a fee to cover our out-of-pocket expenses, plus our then-current per diem charges for our personnel, for any required testing. To ensure adequate insurance coverage, your insurance policies must meet the specifications in Section 17 of the franchise agreement. See rate-Note 5 to Item 7 for additional information. If you choose to maintain a commercial office for your franchised business, we must approve the purchase or lease agreement for, and the appearance of, the office. All signs, logos, emblems or pictorial materials used for the office must conform to our specifications. Also, at least 1 exterior sign of specified design and size, if permitted by local sign ordinances, must be used for the office. We currently maintain a list of approved suppliers and criteria for approving suppliers in our Operations Manual. We may modify this list on reasonable written notice to you. You must purchase all products with our trademarks from these suppliers, who generally will be able to provide you with competitive pricing and convenience of ordering. As to products without our trademarks, you may purchase comparable products meeting our specifications from other suppliers. You may request in writing our approval of additional suppliers. We will grant or revoke approvals of suppliers based on the criteria for approving suppliers in our Operations Manual, and based on inspections and performance reviews. We may grant approvals of new suppliers or revoke past approvals of suppliers on reasonable written notice to you. We will provide you with written notification of the approval or disapproval of a supplier you propose within 60 days after receipt of your request. For this approval or disapproval, we may charge you a fee equal to our out-of-pocket expenses, plus the then-current per diem charges for our personnel. Currently, we have negotiated an agreement with Bargain Printing for you to receive a discount. We do not derive revenue from your purchases from Bargain Printing. We will derive revenues from supplies you purchase from us, as well as from certain suppliers that sell products to you. These revenues will vary from product to product, but generally will range from 10% to 15% of the product's selling price to you. We will use these revenues to offset our operating expenses. IfiDurina our fiscal year ending December 31, ^00^2004. we derived no revenues fremhad no revenue from suppliers. Our revenue from franchisees' purchases artd loasos of services and products bv our franchisees, from us was $17.890.78. or 2.6% of our total revenues of $677.366. These figures were taken from our internal reports and from our audited financial statements. We provide no material benefits to you based on your use of approved suppliers. We have no purchasing or distribution cooperatives. We may, but are not required to, negotiate purchase arrangements with suppliers for your benefit. If you choose to purchase or lease equipment, materials, supplies or services from us, we will attempt to make a reasonable profit from the sale or lease of those items or services. THIS TABLE LISTS YOUR PRINCIPAL OBLIGATIONS UNDER THE FRANCHISE AGREEMENT AND OTHER AGREEMENTS. IT WILL HELP YOU FIND MORE DETAILED INFORMATION ABOUT YOUR OBLIGATIONS IN THESE AGREEMENTS AND IN OTHER ITEMS OF THIS DISCLOSURE DOCUMENT. Neither we nor any affiliate offer direct or indirect financing to you, or guarantee your note, lease or obligations. We do not know whether you will be able to obtain financing for part or all of your investment and, if so, the terms of the financing. (1) Class management software. allAII current curriculum, and other materials for establishing your business. (Section 10.1(a)). (2) Initial training for up to 2 individuals, at a location we determine. Currently, this training is held in the Washington D.C. area. This training lasts 5 business days. (Sections 10.1(b) and 11). (3) For each individual attending initial training, 1 set of the Operations Manual and other manuals, catalogs and materials, as needed. (Sections 10.1(c) and 10.1(i)). (See "Operations Manual" below). (4) Specifications for equipment, materials, supplies and services to be used under the system. (Sections 10.1(e) and 14). Samples of initial advertising and marketing materials. (Section 10.1(f)). (6) If applicable, design and sign specifications for your commercial office. (Sections 5.3 and 15). (1) Offer annual regional, national or international conferences designed to encourage the exchange of information and new ideas between us and our franchisees. You must pay fees to us for these conferences based on our out-of-pocket costs to hold the conferences. (Sections 10.1 (b) and 11.2(c)). (2) Distribute to you reports of improvements in administrative, bookkeeping, accounting, inventory control and general operating procedures, and business merchandising methods (including pricing methods), as they are developed. (Section 10.1(g)). (3) Distribute to you revisions of the Operations Manual to incorporate improvements and new developments in our system, including improvements in services and products you offer to your clients, and recommended prices. These revisions may be made at any time, but will not unreasonably increase your obligations. (Section 12.2). (4) Provide periodic telephone, electronic mail or other assistance on daily operations, marketing, advertising, financial management, personnel and other operating issues that you encounter. (Section 10.1(h)). (5) Make available to you initial training of replacement managers at a location that we determine. For replacements made more frequently than once every 2 years, you must pay training fees. (Sections 10.1(b) and 11.2(b)). (7) Review proposed equipment, material, supply or service contracts to determine if they meet specifications under our system. (Section 14.2). (8) Administer a system-wide advertising and promotional fund. (Section 16.2). (See "Advertising and Promotional Fund" below).